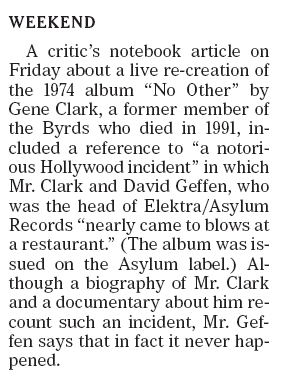 The New York Times featured a piece by Jon Pareles the other day noting the revival of ex-Byrds singer/songwriter Gene Clark and his neglected masterwork No Other. 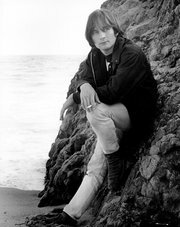 The reputation of Gene Clark’s 1974 album “No Other” — which was initially spurned by its record company and dismissed by critics as overproduced — has been steadily ascending, particularly since an expanded European reissue on CD in 2003. On Saturday and Sunday, “No Other” is to be performed live at Music Hall of Williamsburg, in as close a replica of the original arrangements as 14 musicians and singers can create onstage. It’s the New York City finale of the “No Other” mini-tour organized by Alex Scally of Beach House. Which got the hardwaxing staff to recall our own musical odyssey back in the ’60s. Start with Clark as the main songwriter on the Byrds’ Eight Miles High. From there Clark went on to record the fantastic Fantastic Expedition of Dillard & Clark, with the indelible tracks Out on the Side, She Darked the Sun, and Train Leaves Here This Mornin’. Which got us to thinking about another Byrds spinoff – The Flying Burrito Brothers, which Gene Clark was not a member of, but which produced one of the hardwaxing staff’s favorite songs. There’s always something more to know, yes? This entry was posted in Uncategorized and tagged Alex Scally, Beach House, David Geffen, Dillard & Clark, Eight Miles High, Flying Burrito Brothers, Gene Clark, Jon Pareles, Music Hall of Williamsburg, New York Times, No Other, Out on the Side, She Darked the Sun, The Fantastic Expedition of Dillard & Clark, Train Leaves This Here This Mornin'. Bookmark the permalink.